In 1976, after nearly 20 years as a traveling daredevil, Ken Carter announced his plans to mount the ultimate jump: One mile over the St. Lawrence River from Morrisburg, ON to Ogden Island, NY. Ken Carter then spent four years and almost a million dollars trying to realize this dream, doggedly pursuing daredevil glory despite a host of setbacks. 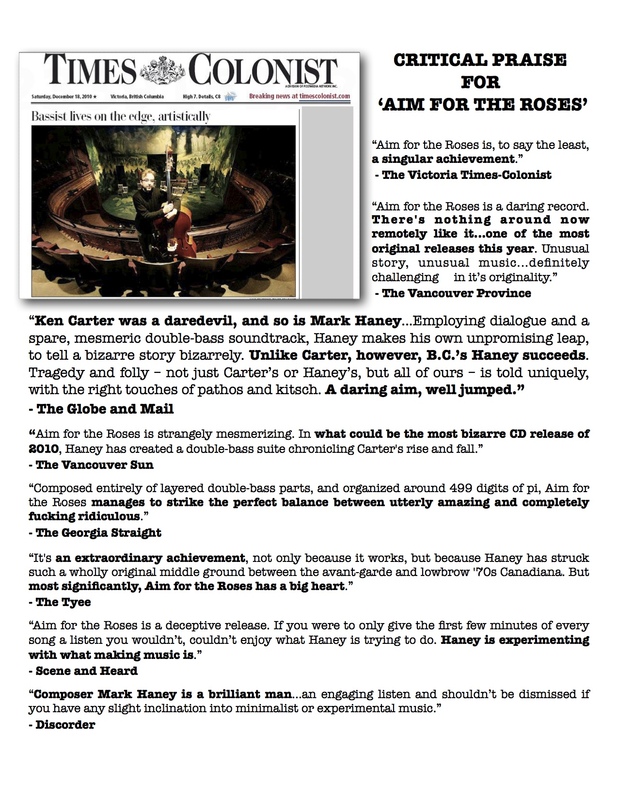 Created by composer/double bassist Mark Haney, “Aim for the Roses” is a unique and compelling hybrid of experimental double bass music, song and storytelling that tells the amazing true story of Canadian daredevil Ken Carter and his 1976-79 quest to jump one mile over the St. Lawrence River in a rocket powered Lincoln Continental. Ken’s story is an uplifting and emotional examination one man’s determination to follow his dream, regardless of the many setbacks and enormous personal cost. “Aim for the Roses” received a Specialized Sound Recording Grant from the Canada Council for the Arts due to it’s innovative structure and creative approach. Some of Canada’s most respected theatre talent is featured on the record, including Andrew Wheeler as Ken Carter. Ken narrates his story with 6 other characters (including Evel Knievel, who was sent by ABC’s “Wide World of Sports” to examine the jump site) performing the songs. Ken Carter’s narration is comprised entirely of direct quotes; these are his words. The sonic backdrop for this story is one of the most intricate double bass recordings ever produced. An experiment in structure as much as storytelling, “Aim for the Roses” is built on top of a musical representation of 499 digits of pi for solo double bass. With the notable exception of engineer/co-producer David Gannett’s acoustic guitar on each of the 9 songs (and some footsteps on “The Ramp Engineer”), the entire recording is constructed from layer upon layer of double bass. Throughout the piece there can be anywhere from 4 or 5 to over 40 double bass tracks, several of which would include intricate, multi-layered loops that help give “Aim for the Roses” it’s distinct aural texture. Mark Haney’s expressive, imaginative double bass playing not only helps to tell Ken Carter’s story, but opens the listener’s ears to the musical possibilities of his instrument.